The brain is the center of the nervous system in all vertebrate, and most invertebrate, animals. Some primitive animals such as jellyfishes and starfishes have a decentralized nervous system without a brain, while sponges lack any nervous system at all. In vertebrates, the brain is located in the head, protected by the skull and close to the primary sensory apparatus of vision, hearing, balance, taste, and smell. Brains are soft genomes in evolutionary terms. All the brains on Earth are indirectly communicate with others to form a interorganismal biological brain (The biobrain). From a philosophical point of view, it might be said that the most important function of the brain is to serve as the physical structure underlying the mind. From a biological point of view, though, the most important function is to generate behaviors that promote the welfare of an animal. Brains control behavior either by activating muscles, or by causing secretion of chemicals such as hormones. Not all behaviors require a brain. Even single-celled organisms may be capable of extracting information from the environment and acting in response to it. Sponges, which lack a central nervous system, are capable of coordinated body contractions and even locomotion. In vertebrates, the spinal cord by itself contains neural circuitry capable of generating reflex responses as well as simple motor patterns such as swimming or walking. However, sophisticated control of behavior on the basis of complex sensory input requires the information-integrating capabilities of a centralized brain. The cortex is the part of the brain that most strongly distinguishes mammals from other vertebrates, primates from other mammals, and humans from other primates. In non-mammalian vertebrates, the surface of the cerebrum is lined with a comparatively simple layered structure called the pallium. In mammals, the pallium evolves into a complex 6-layered structure called neocortex. In primates, the neocortex is greatly enlarged in comparison to its size in non-primates, especially the part called the frontal lobes. In humans, this enlargement of the frontal lobes is taken to an extreme, and other parts of the cortex also become quite large and complex. The relationship between brain size, body size and other variables has been studied across a wide range of species. Brain size increases with body size but not proportionally. Averaging across all orders of mammals, it follows a power law, with an exponent of about 0.75 This formula applies to the average brain of mammals but each family departs from it, reflecting their sophistication of behavior. For example primates, have brains 5 to 10 times as large as the formula predicts. Predators tend to have larger brains. When the mammalian brain increases in size, not all parts increase at the same rate. The larger the brain of a species, the greater the fraction taken up by the cortex. The pallium is a layer of gray matter that lies on the surface of the forebrain. In reptiles and mammals it is called cortex instead. The pallium is involved in multiple functions, including olfaction and spatial memory. In mammals, where it comes it dominate the brain, it subsumes functions from many subcortical areas. The property that makes neurons so important is that, unlike glia, they are capable of sending signals to each other over long distances. They send these signals by means of an axon, a thin protoplasmic fiber that extends from the cell body and projects, usually with numerous branches, to other areas, sometimes nearby, sometimes in distant parts of the brain or body. 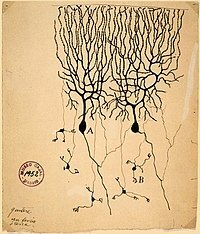 The extent of an axon can be extraordinary: to take an example, if a pyramidal cell of the neocortex were magnified so that its cell body became the size of a human, its axon, equally magnified, would become a cable a few inches in diameter, extending farther than a mile. These axons transmit signals in the form of electrochemical pulses called action potentials, lasting less than a thousandth of a second and traveling along the axon at speeds of 1–100 meters per second. Some neurons emit action potentials constantly, at rates of 10–100 per second, usually in irregular temporal patterns; other neurons are quiet most of the time, but occasionally emit a burst of action potentials. From a biological point of view, the function of a brain is to generate behaviors that promote the survival (more precisely, the genetic fitness) of an animal. This means extracting as much relevant information as possible from the environment, and integrating that information in order to select actions. In some cases, sensory signals call for an immediate response, as for example when the olfactory system of a deer detects the odor of a wolf. In other cases, sensory signals modulate an ongoing pattern of activity, as for example in the effect of daily light-dark cycles on an organism's sleep-wake behavior. And in many cases, information does not call for immediate action but needs to be stored in case it is relevant to a future situation. Integrating all the available information across time in order to satisfy every critical need—for food, water, warmth, safety, and reproduction, among others—is a very complex task. The brain deals with it by parceling out components of the task to functional subsystems, which can be categorized in a number of ways: anatomically (as described above), chemically, and functionally. With few exceptions, each neuron in the brain releases the same chemical neurotransmitter, or set of neurotransmitters, at all of the synaptic connections it makes with other neurons. Thus, a neuron can be characterized by the neurotransmitters it releases. The two neurotransmitters that appear most frequently are glutamate, which is almost always excitatory, and gamma-aminobutyric acid (GABA), which is almost always inhibitory. Neurons using these transmitters can be found in nearly every part of the brain. In fact, they combine numerically to make up more than 99% of the brain's entire pool of synapses. This does not mean that other neurotransmitters are unimportant, though. The great majority of psychoactive drugs exert their effects by altering neurotransmitter systems, and only a small proportion of them act directly on glutamatergic or GABAergic transmission. Drugs such as caffeine, nicotine, heroin, cocaine, Prozac, Thorazine, etc., act on other neurotransmitters. Many of these other transmitters come from neurons that are localized in particular parts of the brain. Serotonin, for example—the primary target of antidepressant drugs and many dietary aids—comes exclusively from a small brainstem area called the Raphe nuclei. Norepinephrine, which is involved in arousal, comes exclusively from a nearby small area called the locus ceruleus. Histamine, as a neurotransmitter, comes from a tiny part of the hypothalamus called the tuberomammilary nucleus (histamine also has non-CNS functions, but the neurotransmitter function is what causes antihistamines to have sedative effects). Other neurotransmitters such as acetylcholine and dopamine have multiple sources in the brain, but are not as ubiquitously distributed as glutamate and GABA. One of the primary functions of a brain is to extract biologically relevant information from sensory inputs. Even in the human brain, sensory processes go well beyond the classical five senses of sight, sound, taste, touch, and smell: our brains are provided with information about temperature, balance, limb position, and the chemical composition of the bloodstream, among other things. All of these modalities are detected by specialized sensors that project signals into the brain. In non-humans, additional senses may be present, such as the infrared heat-sensors in the pit organs of snakes; or the "standard" senses may be used in nonstandard ways, as in the auditory "sonar" of bats. It is not easy to understand the relationship between the physical brain and something as ethereal as the mind. It is hard to doubt that a relationship of some sort exists: the clearest evidence is that numerous drugs, which obviously act directly on the physical substance of the brain, have strong effects on the mind. But what is the upshot? Does this mean that the brain is the mind? Or only that they are bound together in some intimate way? Many people have had a strong intuition, or at least a strong wish to believe, that the mind is fundamentally a separate thing, with an independent existence, capable perhaps of detaching from the body and surviving even after death. Through most of history the great majority of people, including philosophers, found it inconceivable that anything like thought could be implemented by what is in essence a mere piece of meat. Even Descartes, with his mechanistic philosophy, could not imagine how this could be. He had no problem explaining reflexes and other simple behaviors in mechanistic terms, but he could not believe that complex thought—and language in particular—could be explained in the same way. The invention of computers has made a great difference here. We can now see all around us machines capable of processing language in sophisticated ways—not with the full sophistication of a human mind, but nevertheless in ways that earlier generations could not guess at. Nevertheless, some philosophers continue to argue that there are properties of the human mind that cannot, in principle, be explained mechanistically. This problem—the mind-body problem—is one of the central issues in the history of philosophy. The brain is the physical and biological matter contained within the skull, responsible for electrochemical neuronal processes while the mind consists of mental attributes, like beliefs, desires, and perceptions. There are scientifically demonstrable correlations between mental events and neuronal events; the philosophical question is whether these phenomena are identical, at least partially distinct, or related in some unknown way. There are three major schools of thought concerning the answer: dualism, materialism, and idealism. Dualism holds that the mind exists independently of the brain; materialism holds that mental phenomena are identical to neuronal phenomena; and idealism holds that only mental substances and phenomena exist. In addition to the philosophical questions, the relationship between mind and brain involves a number of scientific questions. What is the detailed relationship between thought and brain activity? What are the mechanisms by which drugs influence thought? What is consciousness, in physical terms, and what are the neural correlates of consciousness? These questions fall into the domain of cognitive neuroscience. A computer, in the broadest sense, is a device for storing and processing information. In an ordinary digital computer, information is represented by magnetic elements that have two possible states, often denoted 0 and 1. In a brain, information is represented both dynamically, by trains of action potentials in neurons, and statically, by the strengths of synaptic connections between neurons. In a digital computer, information is processed by a small set of "registers" that operate at speeds of billions of cycles per second. In a brain, information is processed by billions of neurons all operating simultaneously, but only at speeds around 100 cycles per second. Thus brains and digital computers are similar in that both are devices for processing information, but the ways that they do it are very different. Computational neuroscience encompasses two approaches: first, the use of computers to study the brain; second, the study of how brains perform computation. On one hand, it is possible to write a computer program to simulate the operation of a group of neurons by making use of systems of equations that describe their electrochemical activity: such simulations are known as biologically realistic neural networks. On the other hand, it is possible to study algorithms for neural computation by simulating, or mathematically analyzing, the operations of simplified "units" that have some of the properties of neurons but abstract out much of their biological complexity. ^ Shu, DG; Conway Morris, S, Han, J., Zhang, Z-F., Yasui, K., Janvier, P., Chen, L., Zhang, X.-L., Liu, J.-N., Li, Y. and Liu, H.-Q. (2003). "Head and backbone of the Early Cambrian vertebrate Haikouichthys". Nature 421: 526-529. ^ "Dualism and Mind [Internet Encyclopedia of Philosophy]". Iep.utm.edu. Retrieved on 2008-10-28. ^ "Soul, Body, And Survival". Cornellpress.cornell.edu. Retrieved on 2008-10-28. "Flybrain: An online atlas and database of the drosophila nervous system". "WormBook: The online review of c. elegans biology". Shepherd, Gordon M. (2004). The Synaptic Organization of the Brain, Fifth edition, Oxford; New York: Oxford University Press. ISBN 9780195159561. OCLC 51769076. This page was last modified on 30 January 2011, at 16:14.